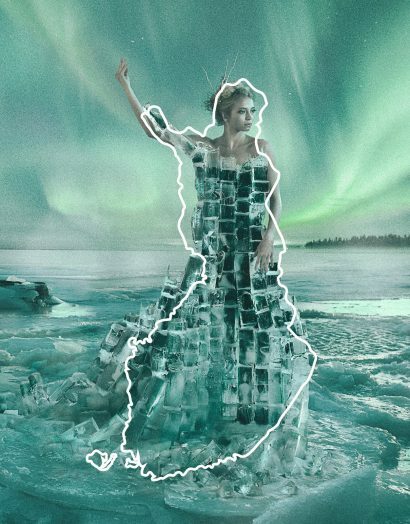 The physical land of Finland takes the shape of a woman with one arm held high. She is wearing a long, fluttering dress, and the nationals of Finland fondly call her ”The Maiden of Finland”. Finland is my homeland, and the country is beautiful. It is a land with a thousand lakes, long winters and has an arctic full of mystery. This year, Finland celebrates 100 years of independence. To capture Finland as a photographer, I embrace my homeland during the season of winter to illustrate its dramatic landscape through the beauty of ice. Months ago, I had a vision of a dress made of ice. ”Impossible!” I thought at first. And, yes, it was almost impossible. But, after six months of planning and preparing, I made it happen by freezing 170 litres of water in milk cartons and creating an icy wall in the shape of a dress. The dress also includes the borderlines of Finland quite nicely, I must say. 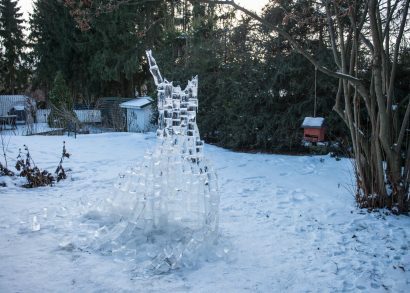 Nevertheless, creating a dress out of ice was not an easy task. There were multiple setbacks and moments of disbelief when I thought the dress would actually not be possible. Below, I discuss the process of how I made my vision happen. There were three main challenges to make the beauty of ice: the number of milk cartons, winters in southern Finland, and freezing 170 litres of water and sealing ice with water and snow. I knew I would need a lot of milk cartons. 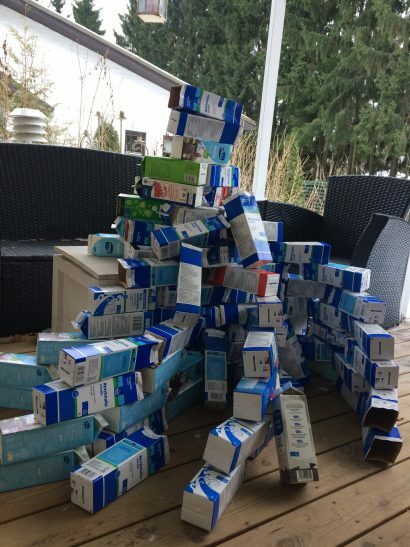 For five months, our family collected every milk carton we drank and piled them up in our backyard. But the requirement was huge, and I had to call a few friends and my childen’s daycare for help. Finally, after 5 months of collecting, I managed to get 170 litres of milk cartons to freeze the water into ice pieces. The ice pieces would later be assembled. Although I live in Finland – a country that is best known for its long winters – this does not actually mean that winters are always snowy and cold. I’m a southern girl and winters here are unpredictable. This winter was no exception. In January, there were only a few freezing days, but mostly it was over zero celsius. I was in trouble! How could I freeze 170 litres of water if the temperature did not drop below zero?! In February, the forecast predicted one week of freezing temperatures. This was my only chance. I started to prepare my photoshoot around that one week. I boiled 170 litres of water to make the ice transparent and not cloudy. That took 4 days. After that, I started to build. Building a dress out of ice was made layer by layer, and I made a mixture out of water and snow to seal the ice. I had to wait until each layer would freeze so that the ice pieces would stay together. It was so cold to play with ice, water, and snow in -7 to -15 degrees for so many days. I did not actually believe the dress could be done until I piled ice cubes around the height of my waist. After five days of building, creating and matching different kinds of ice cubes together, I saw an icy wall in front of me that actually looked like a dress. And, luckily, it had similarities to the shape of Finland. You should have seen my smile! Finding the perfect kind of look to represent the Maiden of Finland wasn’t an easy task. But after searching for the right face for three months, I saw a picture of Belinda on Facebook, and I immediately knew that she was the one! Belinda is a professional Finnish model, and I believe she will shine wherever she goes. I’m so glad that I had a chance to have her to be my Maiden of Finland! I knew that I wanted to include Northern lights into my final image. My colleague and friend, Mikko Halvari, has taken amazing shots of Aurora Borealis so I asked if I could buy one picture that I had seen from his amazing shots. I’m glad that he said yes, and together, we found a perfect background. The Aurora Borealis picture was shot in Kuusamo, Northern Finland. I also ordered a customised composition for the video. The person behind the music is the composer Leena Julin. There is also a hidden piece from the Finlandia hymn, an iconic theme from our national composer Jean Sibelius. We shot the Ice Dress with Belinda and the crew on the 13th of February 2017. After one week of cold days, the weather turned around. The sun was shining brightly in the sky, and the temperatures outside were +5 degree celsius. The ice dress started to melt quickly! When the makeup artist, Satu, and the model, Belinda, were finishing the makeup, a few upper ice cubes fell down because of the melting. I ran inside and told them that there was no time to waste. We shot the photos in short sections because I didn’t want Belinda to get too cold. The ice cubes were falling down, but we lifted them up many times and continued to shoot. And we did it. We got the shots! The dress did collapse entirely after two hours into the photoshoot. I stared at the pile of collapsed ice cubes and realized how close it was to failing. But it didn’t. 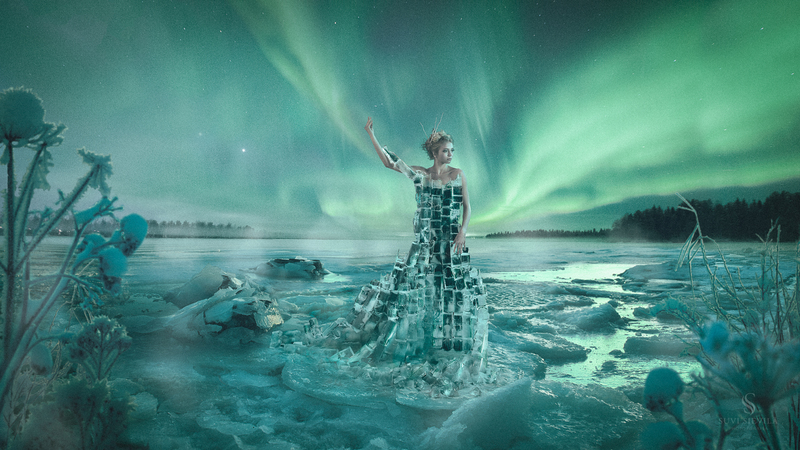 We brought the ice dress to life. And it was made possible after so many phases of planning. This picture of our Maiden is dedicated to my beautiful country, my home, Finland.